You’d be mistaken for thinking that only votes from Mexico earned this iconic stadium its third place in this year’s Public Vote! 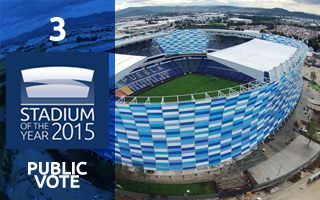 In fact, in Mexico the redevelopment of Estadio Cuauhtémoc caused quite some controversy. Still, compared to major international project of this scale, it represents decent value and quality, while also being a unique stadium with its new ETFE facade. Estadio Cuauhtémoc received 41,420 points during the month-long Public Vote, which represents roughly 13,705 votes and allowed it to take 3rd place. Overall during this year’s edition of Stadium of the Year there were 37,677 participants of the Public Vote, representing 111 countries around the world. More detailed information about the vote will be available soon.